Mummies in the Morning by Mary Pope Osborne. A Magic Tree House Book. Review: Traveling is fun. Traveling through time is even better! 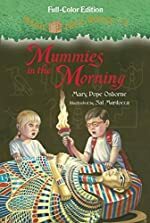 The Magic Tree House: Mummies in the Morning by Mary Pope Osborne is for ealy chapter book readers, and it is an adventurous and interesting story. It is part of the Magic Tree House series with over 50 titles. This story will keep you wanting to know what is happening next. Mummies in the Morning begins with Jack and Annie going up to their tree house where they start reading their Egypt book. Suddenly an Egyptian cat appears. Then the magic tree house spins and goes back in time to Ancient Egypt. They follow a cat into the Great Pyramid of Giza and get lost. A ghost of a past Egyptian queen comes across them and Jack and Annie are frightened. But the ghost helps them find artifacts and get out of the pyramid. The Royal Egyptian parade is approaching them. Will they get out on time? Mummies in the Morning is good and very fast-paced. The plot is interesting and I like the actual parts of real history in it. They do not develop the ghost queen that much, but Jack and Annie are well-developed characters. I like how they look for real artifacts from actual history. They do not explain how the cat appears in the beginning because the tree house has not start spinning because that is how they travel in the book. I recommend Magic Tree House: Mummies in the Morning for kids ages 7-10. We would like to thank Random House for providing a copy of Mummies in the Morning for this review. Have you read Mummies in the Morning? How would you rate it?